Let’s be honest, what man hasn’t dreamt of having their own area to play pool, have friends over, and generally have a good time? This “man cave” is probably closer to many than it has ever been before because the idea is actually becoming a “thing”. There have been some crazy man cave designs in recent years (one even has a bowling alley!) and it has spurred on a whole new generation of dreaming men. So, how do you create the ultimate man cave? Choose Wisely: The first step is to choose the room in which you want to create this new haven; it is all well and good deciding to use the garage but there are a few key factors that have to be considered. Firstly, you need to consider whether you have proper air ventilation and temperature control. You don’t want to have to go through the disappointment of setting everything up perfectly only to realize that the room cannot be used in the winter months (or it can, as long as you wear four layers). Secondly, you need to pick a room that has a good size; it doesn’t have to be able to fit an olympic-size swimming pool but you do want to try and get a few entertainment options in there. Plan: Once you have chosen the room, it is time to start planning. 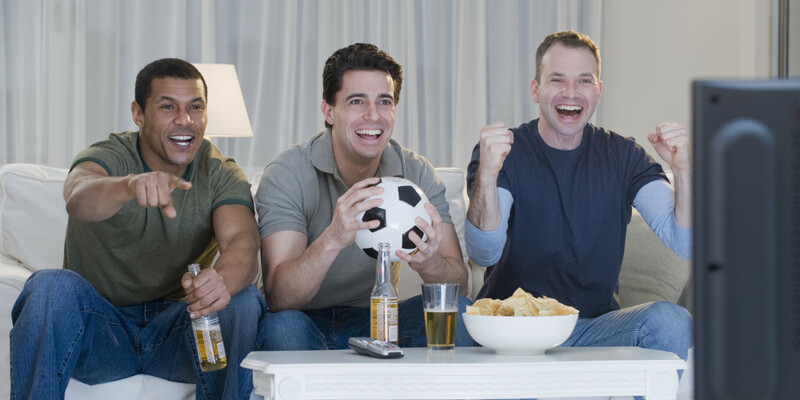 Of course, if you are going to have friends over to watch the games, you will need some sort of sitting arrangement, a mini fridge for the beers, and maybe even a toilet (though this is an optional extra as it may not be entirely affordable or practical). This is an important stage as you need to be able to run the wires from your TV to a socket. And then everything else has to point at the TV, right? If you are struggling with the planning stage, why not hire an architect? This could give it the extra push you are looking for; always remember to stay in control though as this is your man cave, after all. Create: Apart from watching the Super Bowl with a beer in one hand and a slice of pizza in the other, this is the best part of the process as you start to see your creation come to life. Don’t be afraid to call your mates and tell them to pitch in here because they will be enjoying the man cave just as much as you. Remember to take all the important steps first such as any big practical changes that have to be made; a good place to start is with the walls and floor. Acoustic panels can be a great option for a man cave, especially if you plan to jam with your friends, as they will provide great sounding acoustics. Acoustic panels use materials that absorb any unwanted noise and what’s more, they are normally made from recycled plastic so you will also be helping the environment. Finishing Touches: When you have your flooring laid and the walls all panelled up with your favorite designs, you can then turn your dream into reality by installing all the “important” parts. This is where you can install the TV, get the sofas in place, get the minibar warmed up, bring in the pool table, put up the dart board, install the surround sound, or whatever it is you want to include. You also want to include all those little touches of individualism that make it yours, try to design something unique that you’re not likely to find anywhere else. Here are some ideas. On a serious note, as you grow older it can become hard to stay in touch with all your friends but having the man cave there at your service will ensure that you never lose contact with those around you. The man cave really comes into its element when you set a frequent meeting time, maybe once a week, where you can sit down, have a few beers and generally enjoy living.